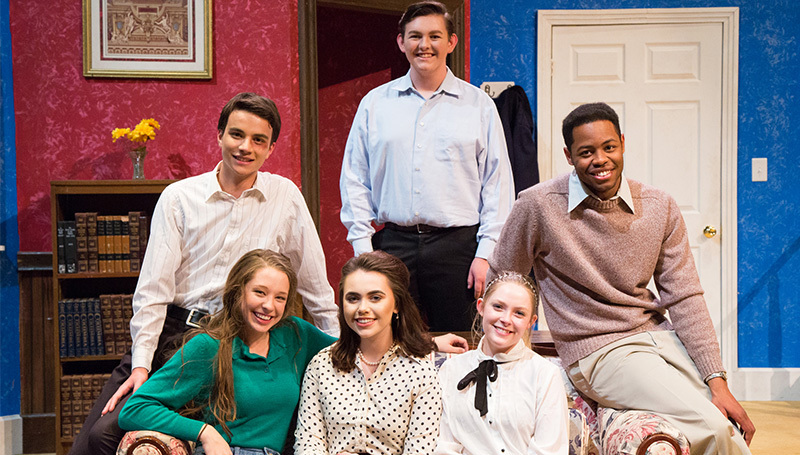 Southern Theatre will present “How the Other Half Loves” at 7:30 p.m. Wednesday, April 25, through Saturday, April 28, in the Bud Walton Theatre at Missouri Southern State University. Written by Alan Ayckbourn, the play centers on three couples, with all three men working for the same firm. One of the younger men is having an affair with the wife of the oldest, and when each returns home suspiciously late one night or early one morning they invent a story about having to spend some time smoothing domestic matters in the home of a third couple. Of course, the third couple have to show up to put the fat in the fire, but that complication only adds to the fun of this famous farce. Directed by An Lile, the cast includes Nicholas Cortez and Allison Dodge, both of Joplin; Chelsie Jeffries, Webb City; Hulon Smith, Waynesville; Preston Hamilton, Baxter Springs, Kan.; and Kayley Baumover, Wichita, Kan.
Tickets are $7 for adults and $5 for seniors and students, and can be purchased at the door. The box office will open at 6:30 p.m. for each performance.